I have recently been on holiday in Devon and Somerset – and on my blog I have put something about the Jubilee Wall which has been built on Watchet Station and how the stones in it are very similar to the wall which used to stand in Cadet Place in Greenwich, off Banning Street – and how I hope our Planners have arranged to have our wall rebuilt. I thought I should explain some of the background to the site in Greenwich which was adjacent to the Cadet Place wall. This is the site which is now the big hole downriver of the new housing on Lovell’s Wharf, and which will be the next site to be developed. It is also the site where the ancient tide mill was found recently. So - when I was seven we went on holiday to Bournemouth. And most of all I remember a visit to the Great Globe at Swanage and I came back to the Globe fifty years later but this time here in Greenwich. What we now know as the Lovell’s Wharf area had previously been developed in the 1840s by Coles Child, for Morden College. 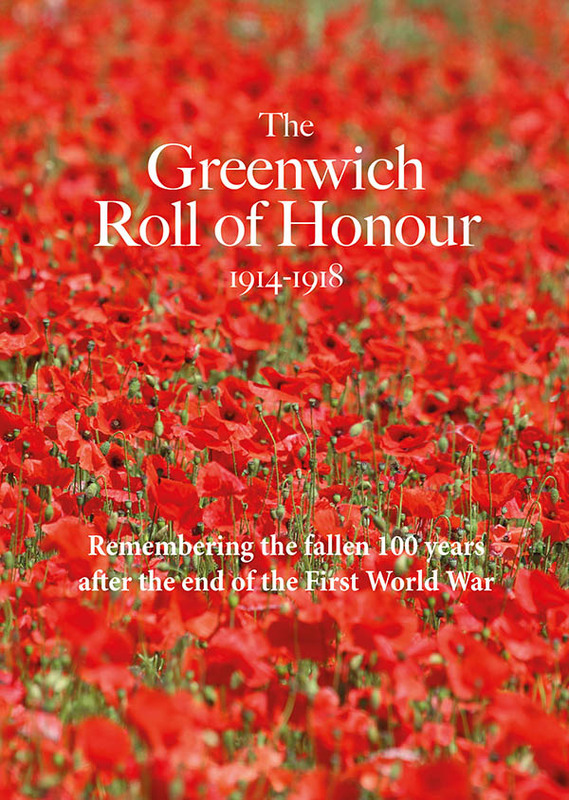 What we now call Lovell’s, he called ‘Greenwich Wharf’ – part of it became known as ‘Granite Wharf’ because in 1852 he leased it to Mowlem, Burt and Freeman. The original John Mowlem had worked in the Dorset stone quarries and then came to London and founded the famous contracting firm in 1823. He began with paving contracts and a wharf at Paddington. By 1852 he had retired to Swanage and the firm was then managed by his nephew, George Burt. Mowlem and Burt made an extraordinary collection of bits and pieces taken from the London streets and took them back to Swanage where visitors today can follow trails to see them. Mowlem’s Greenwich wharf was their ‘stone yard’. In the 1860s there are records of their ‘substantial buildings’. By 1869 maps show rails appear going to the river edge, and a slip with ‘mooring posts’ and a crane. ‘Cadet Place’ was called ‘Paddock Place’. At Durleston Country Park near Swanage they sell a postcard which shows the Great Globe, now on site there, as being built in Greenwich. 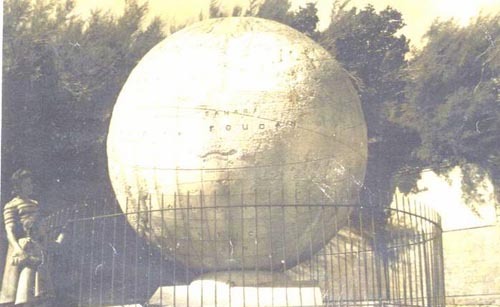 The Globe was the idea of George Burt who had earlier commissioned a smaller granite globe, now on display in Beaulieu. 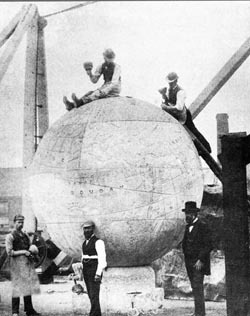 The Great Globe is made of 15 pieces of Portland stone – held together with granite dowels. It was taken from Greenwich to Durleston sections by sailing boat. Whether the stone originally came from Swanage is not known – but the expense of carting 40 tons of stone between the two must have been considerable. Cadet Place had this extraordinary wall of what appears to be pieces of random stone, some of in a blocked up gateway. Geologist, Eric Robinson, called it ‘Cyclopean’ and identified the stone as part of Mowlem’s stockpile of stone. Eric says it includes ‘White Portland Stone, some of it dressed with the stone pick, pink and red sandstone – not necessarily as hard as the Coal Measures York Stone - they are joined by ‘Bluestone’ (Diorite). At either side the blocks sit at unusual angles with an infill of angular pieces of dark bluestone – this dark stone came from Guernsey in the Channel Islands and was much used in kerbs and cobbles’. He says that this miscellany is almost a museum of the sort of stones which made up the stone cartage trade in the English Channel – ‘just add some granite’s. He continues, ‘look at the cobbles and smaller cube setts in the entrance to the yard and you see all of these granitic rocks polished by cart wheels and cars’. Elsewhere, Eric has provided guides for school children (and adults too) who want to explore the world of stone in Greenwich – and he promised me more information when I spoke to him last week I was not as lucky as a small child. When we visited the Globe at Swanage in 1947 I had no idea what it was – but, gosh, I was impressed!